If your order weighs less than 13 ounces, save huge on shipping with USPS first class (with tracking number). This product weighs 1.6 oz. 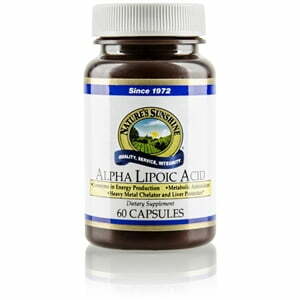 Nature’s Sunshine Alpha Lipoic Acid is an antioxidant that helps to remove harmful toxins from the body. ALA may also help relocate calories to energy production instead of just storing as fat. ALA also supports blood sugar levels, which strengthens the body’s cardiovascular system. Nature’s Sunshine Alpha Lipoic Acid contains turmeric, which is an antioxidant that supports the liver. 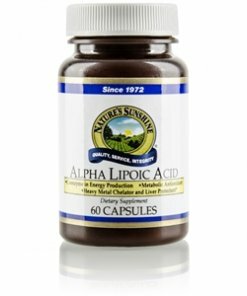 Each capsule provides 250 mg alpha lipoic acid. Instructions: Take two capsules daily with a meal. Magnesium stearate (vegetable), silicon dioxide, cellulose, glycerin, and water.